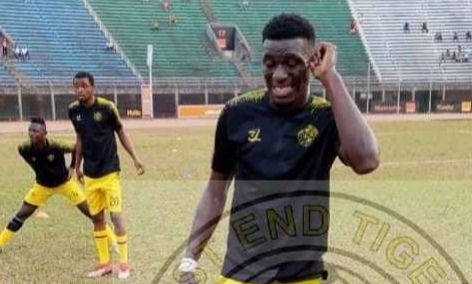 The domestic league top scorer Sesay heaped praised on Tigers squad spirit. Sierra Leone Premier League top scorer Baimba Sesay has heaped praised on East End Tigers spirited squad after a hard fourth win in Kono. The striker, who scored the winner against Diamond Stars on Saturday has now accounted for seven goals in ten appearances. Sesay and his teammates have enjoyed a successful season so far winning five of their ten matches. As a result, they’re second place behind FC Kallon four points adrift. “Hopefully, I’ll keep that motivation because I see this as an opportunity, ” Sesay said. Meanwhile, the Tigers keeper Alhaji Nyelenkeh, who collapsed suddenly on the pitch in Koidu on Saturday has recovered. He was part of the team departed Kono for Freetown but, will be under observation in the next few days. Connect with us @football_sierra, on Facebook/Instagram Football Sierra Leone. Baimba Sesay after our victory against Diamond Stars has heaped praised on teams spirit. "The strength in depth of our squad keeps me motivated". "I'm happy to be part of such a spirited squad."